Plus £100 security deposit, refunded on safe collection of the tub. Please contact us for prices on longer hire periods. Plus £100 security deposit, refunded on safe collection. Christmas Hire- 1 week hire from 18th December until 27th December £300 or extend this for a further week over New year with collection on 3rd January for £400. If you would like to hire for one week over New year the price for this is £300. Please call now to check availability. Delivery is Free within 15 Miles of our base, LE17 5DR. Please contact us for a price if you live further than this, I am sure we can accommodate you! How to book: Please either call us, fill in our online booking form or email us at info@epichottubhire.co.uk and we will look at availability and answer any questions you may have. Once we have confirmed the date with you and you are happy we will then take a security deposit of £100. The balance of hire is then taken on delivery and your security deposit is returned on collection. It is that simple! We will deliver the tub, set it up and start to fill it and talk through the tub operation and water care. We leave you to complete filling it. Once filled you turn it on and wait until it heats up! We will deliver the tub two days before your hire period starts so it is hot in time, or you can choose to fill it hot and enjoy a couple of extra days for Free! Our hot tubs are unique in the way that they heat the water. 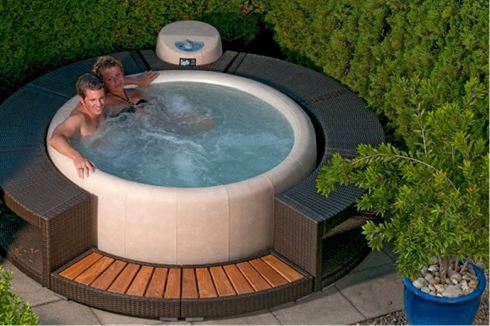 The motor unit does not have a heater like most hot tubs, but will still heat up to 40 degrees! When the motor runs it generates heat, which is recycled to heat the water, making it the most economical hot tub in the World. The benefit to you? It will only cost about £3 per week to run! The Tubs we use cost between £5,000 to £6,000. 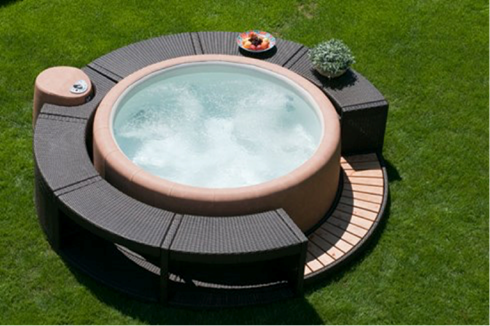 Feel free to come and take a look at the Softub hot tub before you hire it. We are based at Palmers @ Ullesthorpe Garden Centre, Lutterworth Road, Ullesthorpe, Near Lutterworth LE17 5DR. Just 10 minutes from Junction 1 of the M6 or 5 minutes from junction 20 of the M1.